Admit it - we all want clear glowing skin without the faff of using a million and one products everyday! People often ask how I keep my skin clear, and with the odd spot now and again, my skin is generally quite good and my skincare routine is far from complex. With a few key steps, it's simple to keep your skin looking gorgeous and blemish free! The first step in both my morning and evening routine is to use a cleansing water, like my trusty one from Garnier. I apply some to a cotton pad and gently work in to refresh my face and remove any impurities or dirt before using any other wash or cleanser. It's also very handy to use in the evening for removing makeup, especially that hard to remove waterproof mascara! One step I find super beneficial for keeping my skin clear and glowing is using a daily facial scrub. These will rid of any dry, dead skin cells to reveal new, fresh feeling skin! My current love is again from L'oreal in the form of their Skin Perfection Radiance Revealing Exfoliator. This is great as it's quick, easy and smells of peaches, which is always a bonus! 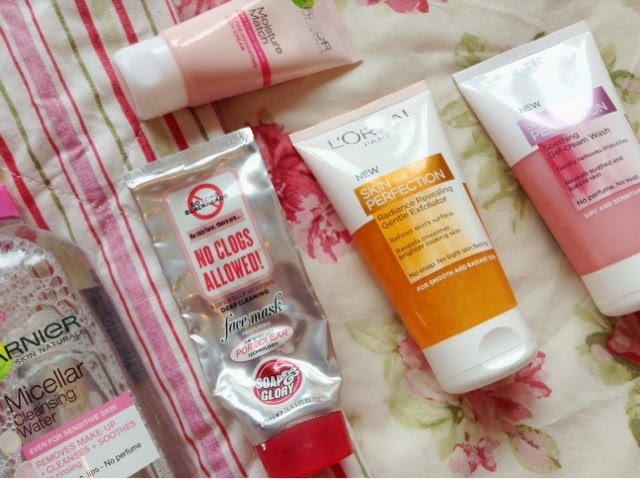 If you only do one step from these steps, make it moisturiser! Your skin needs hydration in order to feel and look it's best, and essential as a smooth base if you're going to be wearing makeup. I'm currently using (and loving!) the Garnier Moisture Match cream in Goodbye Dry, but there are five different formulas depending on your skin type - and at under £5, what more could a girl need!? The final step in my routine is a lovely detoxing mask at the end of the week, to unclog my pores and prevent future breakouts. A great one to try is the Soap and Glory No Clogs Allowed, which is self-heating so you can truly feel the mask working it's magic, and it contains salicyllic acid to fight any pesky pimples. 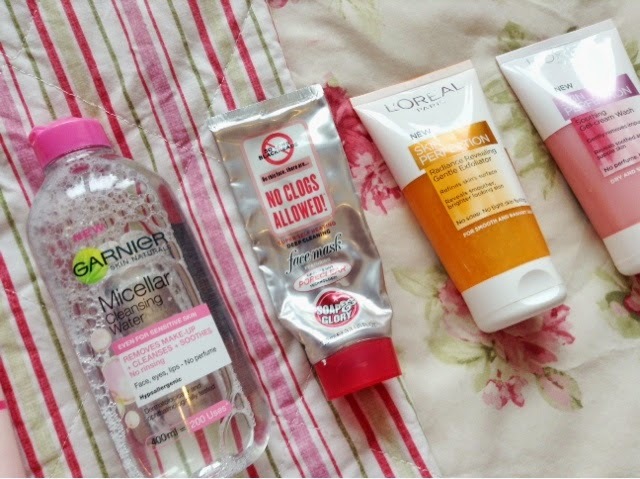 And that concludes my lazy girl's guide to skincare - who knew achieving the glow was such a doddle.